Sensor technology is rapidly advancing, enabling smaller and less expensive instruments to monitor Earth’s environment. It is expected that many more kinds and quantities of networked environmental sensors will be deployed in coming years. This work presents an approach for the smart configuration and integration of marine sensors into an interoperable Sensor Web infrastructure such that the overall life cycle cost of sensors and observing systems is reduced and data has greater societal and scientific value. 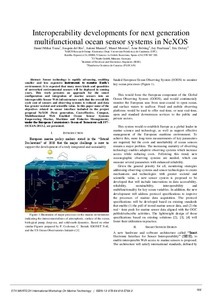 In this paper some of the objectives related to sensor interface included in the project proposal NeXOS (Next generation, Cost-effective, Compact, Multifunctional Web Enabled Ocean Sensor Systems Empowering Marine, Maritime and Fisheries Management), under the European Commission’s Ocean of Tomorrow call FP7- OCEAN-2013.2, are presented. Toma, D. [et al.]. Interoperability developments for next generation multifunctional ocean sensor systems in NeXOS. A: International Workshop on Marine Technology. "MARTECH 2013 : 5th International Workshop on Marine Technology : 9th - 11th October 2013, Girona". Girona: 2013, p. 166-168.